That’s ridiculous, said Investor’s Business Daily in an editorial. Trump “hasn’t been in office long enough to take credit or blame for the GDP number.” What we’re seeing is the continuation of the weak growth that prevailed under President Obama, who presided over the “slowest economic expansion for any president since the Great Depression.” What’s more, there’s no real reason for concern, said Jeffry Bartash in MarketWatch.com. 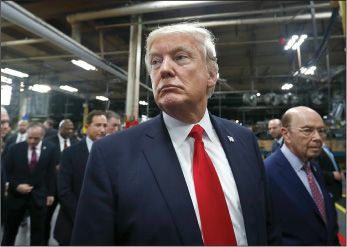 “Over the past several years, the U.S. has usually started out slowly in the first quarter, only to see a frantic burst of growth in the spring.” With a strong jobs market, high consumer confidence, and corporate America “thrilled by the pro-business policies of the Trump White House,” many economists expect to see growth speed up to 3 percent or more in the second quarter. “First-quarter slowdowns have become such a regular feature of the U.S. economy” that it’s tempting to ignore this one, said Justin Lahart in The Wall Street Journal. We shouldn’t. There’s a big red flag buried in the data: Consumer spending, which accounts for about two-thirds of the economy, is slowing down. Americans cut back sharply on big-ticket purchases like cars and appliances, causing overall spending to grow at just 0.3 percent, the worst showing since 2009. This slowdown is troubling because consumer spending wasn’t the culprit behind other weak first quarters, which were generally thrown off by seasonal quirks like unusual weather.